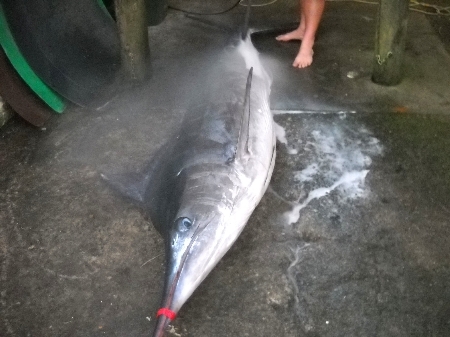 Last Feb, 118 kg stripy, off Hokianga had about 15 very recent jack macs - caught at 08.30. Stripys are like a rubbish tin, But the most commen in what I have seen are Macs ,squid, rays bream. 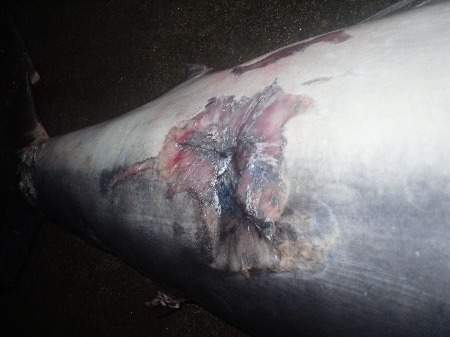 got our first proper stripy in last night was 128kg a mean looking fish guts were full as of what looked like kohes -also check out the smaller stripy's wound that has healed maybe giant squid? Do you water-blast them with salt water, or fresh? Is it to get rid of the slime and bacteria etc before you cure them? Just curious. find much man mad stuff inside fish Ilex? Dam kezza thats a weird one mate. Wonder what area that tuna had been in when it pick up that? I'm guessing that's the sort of Jig they might use for those big humboldt squid. 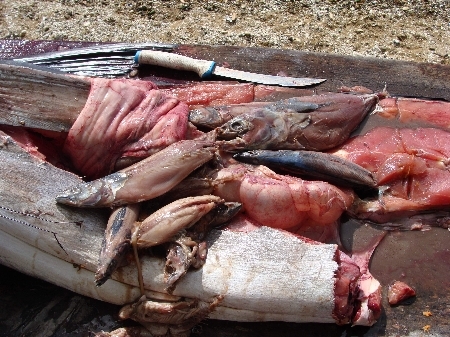 Everyone who butchers a marlin should report in!! Thanks for that widerange - surprising how big some of those jack macs get!! Or were they blue mackerel? Posted this in another post but thought i'd add my two cents from my one and only marlin. West Coast, Kaipara, fresh mullet in guts. 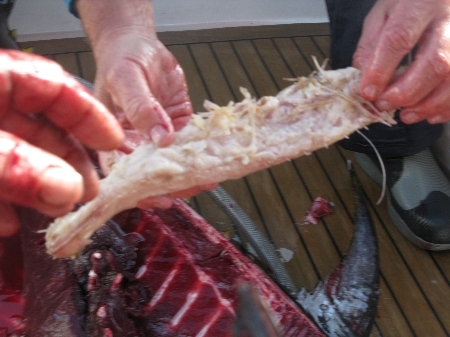 Matt's greymouth sword was chokka full of....*drum roll*....frostfish!....Thats 100%! Kezza - tell us about that oarfish - are they deep dwellers? Yep on ya Graeme, cos a mate that regularly fishes west coast Ahipara area says the Stripeys come right into the shallows at night, this time of the year and feed up on Grey Mullet. Got a 100kg Stripy in 120-130 off Cape Brett. Loaded with big Jack Macks. My mates dad tagged a stripy solo in 120 off the pin last Saturday, Came accross a 2metre round Jack mack ball with 4 or 5 Stripeys hammering them, he hooked up as soon as he got near it. This skippy was in the 352kg blue we got on Saturday. Would have gone 7kg easy. intense wounds on that fish Zane.....sent those pixs toe Steve O'Shea? very interseting stuf keep it coming zane and pass on to your old man the marlin is smoked perfectly again. definately getting that landrover tyre recipe sorted. Only guess would be a juvenile sunfish? Manukau YFT from the other week didnt reveal too much. Just a baby squid and a jakka or small kohe..
Found this bit in Wikipedia which was interesting. There was also a study done in 1955 which comes up on Google that I have also copied in the abstract. Can't get the rest because you have to pay for it! From Wikipedia: Blue marlin are eclectic feeders preying on a wide range of prey species and sizes. Scientific examination of blue marlin stomach contents has yielded organisms as small as miniature filefish. Common food items include tuna-like fishes, particularly /wiki/Skipjack_tuna - skipjack tuna and frigate mackerel (also known as /wiki/Frigate_tuna - frigate tuna ), /wiki/Squid - squid , /wiki/Mackerel - mackerel , and scad. Of more interest to sport fishermen is the upper range of blue marlin prey size. A 72-inch white marlin has been recorded as being found in the stomach of a 448 lb blue marlin caught at Walker's Cay in the Bahamas, and more recently, during the 2005 White Marlin Open a white marlin in the 70 lb class was found in the stomach of one of the money-winning blues. Shortbill spearfish of 30 to 40 lb have been recorded as feed items by Kona blue marlin fishermen. 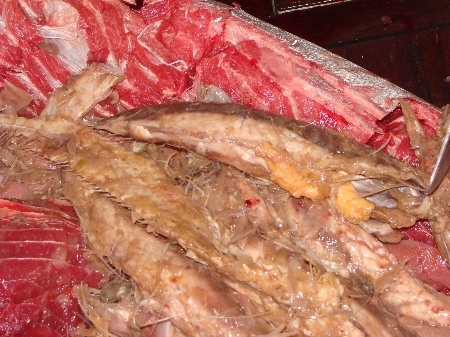 Yellowfin tuna of 100 lb or more have also been found in the stomachs of large blue marlin. Hey Dave.....i reckon you are right on the money with good ol' Ranzania laevis (Slender Sunfish)...nice find on both accounts....it's a new one for me and thanks heaps for the 'challenge'....I haven't heard back from Dr. Pepperal yet but I reckon he'll concur the boys and girls at Te Papa would be keen for a squizz as apparently they are the rarest of all the sunfish....do you still have it? Cheers for taking it further Kezza. It was returned back from where it came unfortunately. <SPAN ="goog_qs-tidbit goog_qs-tidbit-0 goog_qs-tidbit-hilite">From Wikipedia: Blue marlin are eclectic feeders preying on a wide range of prey species and sizes. 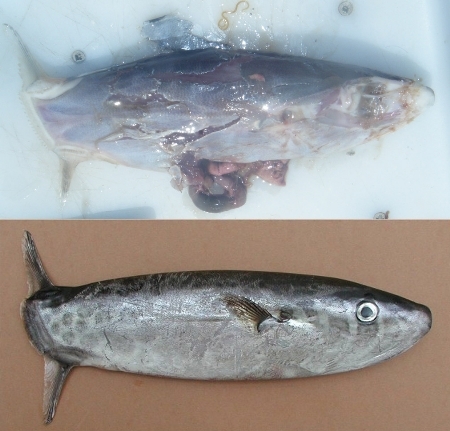 Scientific examination of blue marlin stomach contents has yielded</SPAN> organisms as small as miniature filefish. Common food items include tuna-like fishes, particularly /wiki/Skipjack_tuna - [COLOR=#0645ad - skipjack tuna[/COLOR - and frigate mackerel (also known as /wiki/Frigate_tuna - [COLOR=#0645ad - frigate tuna[/COLOR - ), /wiki/Squid - [COLOR=#0645ad - squid[/COLOR - , /wiki/Mackerel - [COLOR=#0645ad - mackerel[/COLOR - , and scad. 103kg stripie caught jan 2011 at bird rock (cape brett) on a live skippie, out of a acre of feeding skippies...as you expect gut was full of skippies, ( they aren't all visible in the pic but I counted 10 in total). 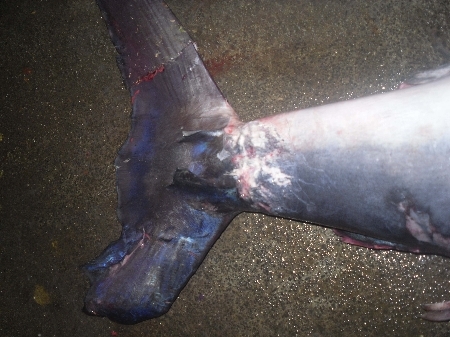 Bluefin tuna 2008. 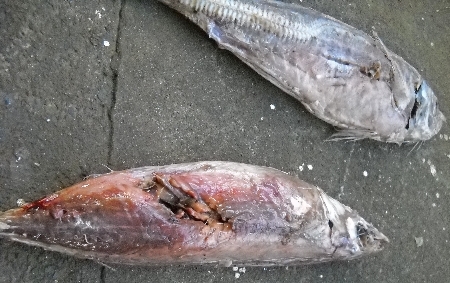 Afraid I cant remember any details on this particular fish but looks like mostly hoki bones in there, maybe a frostfish (2nd pic) and a piece of string. ~280kg Bluefin, caught cubing off westport 8/9/09 about a week after the last trawler had packed up and left. Gut contents that I could identify were mostly redbait and a couple of frostfish. This one had a full belly, I would of pulled about 15-20kg of redbait out of it. This was in my broadbill from last month, not too sure what was there as it was so far digested. Just pupils and spines of maybe saurie??? you serious? 2 pinkies and in june????? I'm hoping this thread continues on in to the oh-twelve!! Tezza - anything interesting in the pooh-shoot of your guys YFT? Agreed. kezza - will take stomach contents shots if can! yay this forum has started up again! Here's mine 21012012 1x frostfish and 1x mullet. 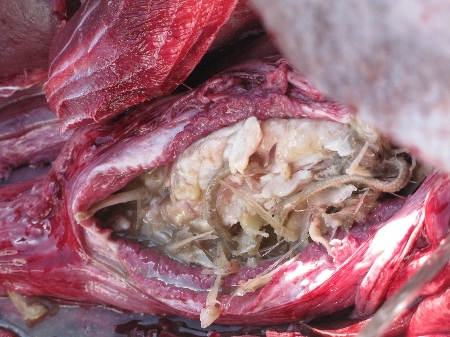 Is it common to find the guts full of live worms? 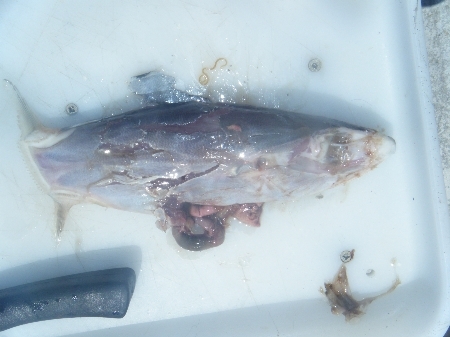 I wonder if those fish on the bottom I was picking up on the sounder while I was playing this fish were frostfish. mmmm thats interesting that it had a mullet in it, how far out did u catch it? Over 8mile to nearest land. Interesting find....2 species that one tends to consider live at either sides of the benthos.....cheers for sharing! 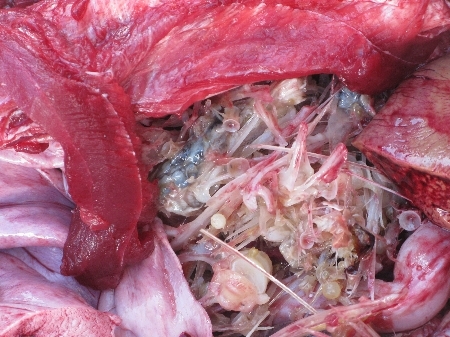 Ps: parasitic worms are very common.....lice, gut worms, skin tube worm things, flukes....yummy! our one had an empty tummy. Always good to find the hungry and desperate ones. What time of day was it caught? Bump to keep this alive - fascinating topic! A mates one a few weeks ago apparently had a gemfish in it. Have heard of mullet before Epic. Who knows, maybe I should be livebaiting some of those gurnard! Bump. A few tournents been on with a number of fish weighed? Even might be worth contacting the guys who smoke the fish for people? Our stripie off North Cape was empty. Ilex....when you say Koheru - are those true koheru? Or jack mackeral? yer one of ours this yer had true koheru "blues" in them ours had 12( and big big buggers, full gut and we got it on a live skippy crazy dont know were it was going to put it when it swallowed it), was quite close to the nine pin so may have been feeding closer to the rocks earlyer that day. Or are koheru schools out deep normal? I've seen a meatball of them out in the Kumera patch. All we saw with them were Mahimahi, but I bet there was something else there too because they weren't frightened by out boat trolling though them. how big would you guys reckon those one's inside the Marlin were???? ?